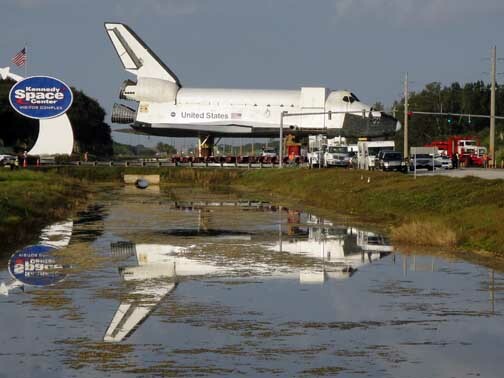 On Sunday, December 11, 2011, the high fidelity Space Shuttle mockup that has been at the Kennedy Space Center Visitor’s Center was moved 5.6 miles from the Visitor’s Center to the Media Press Site 39 parking lot adjacent to the turning basin. 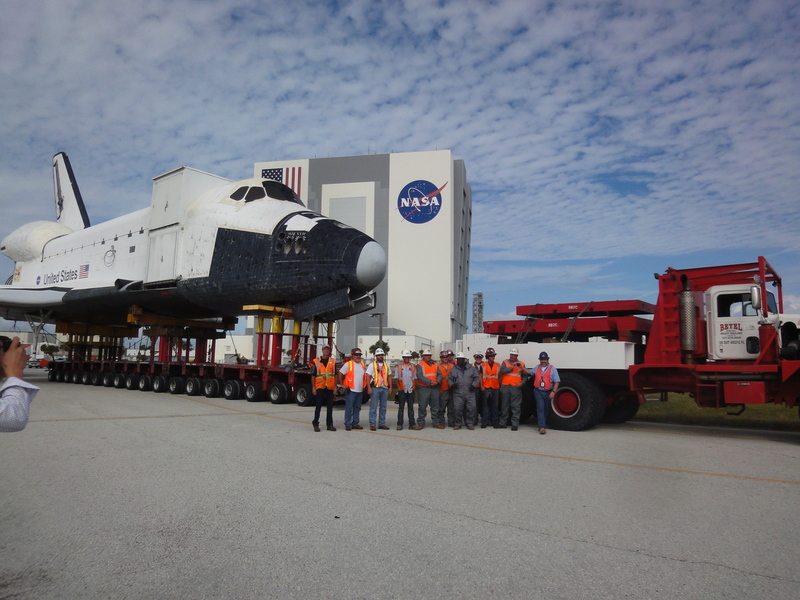 In March this shuttle, known as “Explorer” while at the Kennedy Space Center, will be placed on a barge and sent to Galveston, Texas, and then on to the Johnson Space Center in Houston for permanent display. The move took about three hours, starting about 7:30 am and ending about 11 am. The Shuttle mockup leaving the Visitor Center. This mockup never flew in space. With it gone, the Visitor Center will build a special building to house a real Shuttle which is expected to be on display in late 2012 or early 2013. This photograph was taken at Location 4. This is the intersection of Schwartz Road and Contractor Road. The Shuttle has turned north and is headed up Contractor Road past the Railroad Engines. Movement of the Explorer, as it was known while at the Visitor's Center, went much quicker than expected. Originally the media was told movement would begin at 7:30 am and taken until 3 pm. In actuality movement began at 8:30am and ended at 11 am. This photograph was taken at Location 7 (see map of route below). Nearing the end of its 5.6 mile journey to the Pad 39 Media site parking lot, adjacent to the turning basin, the movers stopped the shuttle move for awhile to allow photographs in front of the Vehicle Assembly Building. Then they gathered and photographed themselves in a group shot. (Location 7) A few hundred yards from the Pad 39 Media site parking lot, and the Turning Basin, the mover-guys pulled over, piled out and allowed the media to takes pictures of the shuttle, and of themselves, in front of the VAB. Then, with the media done, they piled in front of the shuttle and their truck, for pictures of their own. These guys finished what was expected to be a 7.5 hour journey of 5.6 miles in a tidy 2.5 hours. They were so good that everybody was home in time for Sunday lunch and the afternoon football games. Carol Anne Swagler, self portrait. 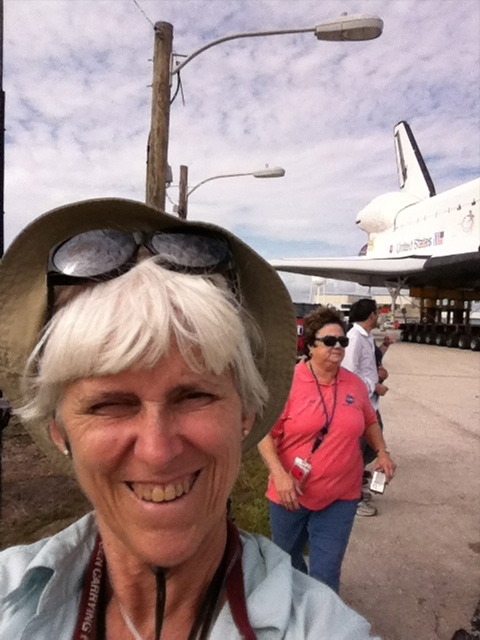 Ms. Swagler is accredited as a photographer and, you will note, she got herself entirely in the photograph but only half of the Shuttle. She would argue, and we would agree, she got most of what she was going for in this picture. Ms. Swagler took 267 photographs of the move on Sunday, December 11, 2011. Patricia Christian (in red behind Ms. Swagler), NASA public relations, was one of several escorts on Sunday. (Location 7). 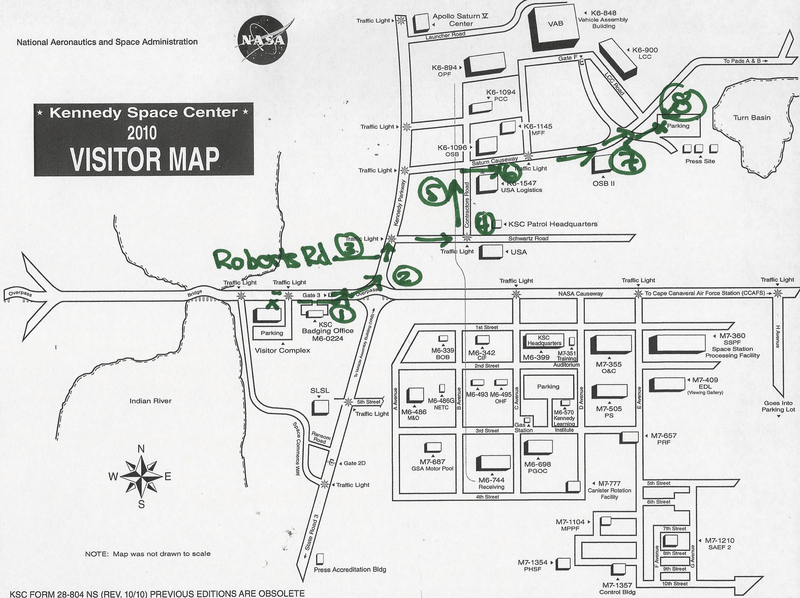 (CLICK to ENLARGE) This is the route from Visitor's Center to the parking lot at the press site. The media photographed the movement from 8 sites marked on this map. How many shuttles are there? Where will they go? Where will the shuttles go? How many mockups were built? — where are they? What was OV-95? — where did it fly? COLUMBIA = OV-102 … Columbia broke up as it was preparing to land and was lost, along with its entire crew, over southeastern Texas on February 1, 2003. CHALLENGER == OV-99 … Challenger broke up and was lost, along with its entire crew, over the Atlantic Ocean shortly after launch on January 28, 1986. DISCOVERY = OV-103 … the oldest surviving Orbiter will go to the Smithsonian Air and Space Museum at Dulles International Airport early in 2012. Currently hazmat materials, useful instruments and other parts that may be of later use are being removed at Kennedy Space Center, Florida. Discovery has been in one of three hangars at Kennedy Space Center. ATLANTIS = OV-104 … the second oldest surviving Orbiter, and the fourth of four originally built, will stay at the Kennedy Space Center. Atlantis will be the final shuttle to fly and is scheduled to be launched on July 8, 2011. ENDEAVOUR == OV-105 … the youngest in the fleet, and by all accounts in very good shape “with quite a lot of life still left in her”, according to one NASA official. Endeavour will go to the California Science Center in Los Angeles. She completed her final mission on June 1, 2011, landing at KSC at 2:32 am. Endeavour was built as a replacement when The Challenger was lost in 1986 and joined the fleet in 1991. Where were the shuttles built? All five shuttles were built in Palmdale, California, south of Edwards Air Force Base where shuttles originally landed during test flights, and on the earliest missions, prior to construction of the SLF (shuttle landinf facility = runway) at Kennedy Space Center, Florida. Later Edwards, and White Sands, New Mexico, were backup landing sites, and both were occasionally used. Unlike the original four shuttles, construction of the Endeavour was speeded by availablily of replacement parts for the first four shuttles. Strictly speaking, unlike the first four, Endeavour was not built from scratch. where did THAT shuttle come from? New York is getting a shuttle, but then again, it isn’t. New York will get the shuttle, Enterprise, currently on display at the Smithsonian. Enterprise never flew in space, but did fly in Earth atmosphere in test flights. Enterprise will be moved to New York and placed on display there. It’s a shuttle, but it was never an operational shuttle that flew in space, unlike the other three surviving shuttles. The shuttle New York City will get was an important vehicle in the development of the shuttle; it’s not some cardboard cut-out dummy, and it came close to having a life of its own in space not once, but twice. An excellent telling of the Enterprise’s history, and how it nearly became an operation shuttle itself is HERE. Why didn’t Texas, with Mission Control located at the Johnson Space Center in Houston, get a shuttle? There were only so many to go around and the prevailing thought is: politics: Texas didn’t vote for President Obama in 2008. 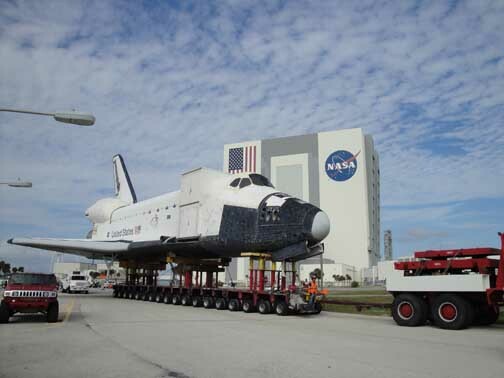 The shuttle mockup, Explorer, began its trip to Houston on December 1, 2011. Its name was painted out prior to the move from the Kennedy Visitors Center. Texas is, however, getting a shuttle mockup. The Explorer, a high definition shuttle mockup built and on display at the Kennedy Space Center Visitors Center, is on its way to Houston. 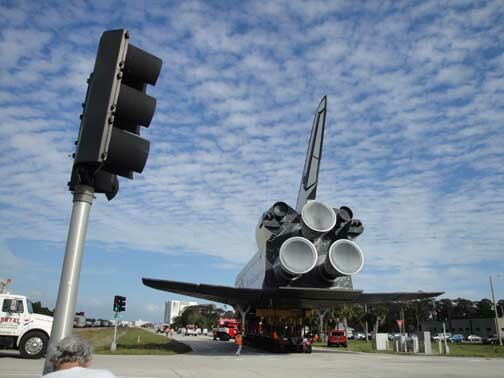 It was moved from the Visitors Center in Florida to Pad 39 Media Parking lot adjacent to the KSC turning basin on December 11, 2011. It will be shipped by barge to Galveston, and then moved overland to the Johnson Space Center in Spring 2012. OV-95 = SAIL The Shuttle Avionics Integration Laboratory Shuttle This was the first shuttle to “fly” although it never flew in space. OV-95 was an exact mechanical replica of the other shuttles and used both to test systems and to fly (on the ground in tandem) beginning with a shuttle lift-off. SAIL was located in Houston. When STS-135 landed, it was broken up, the wiring re-cycled and the remainder discarded. PATHFINDER (mockup) == (unofficially OV-98) This mockup was used to test road clearances and other non-operational spacial issues related to how the shuttle could and would be moved. At various times, after its use, it was in Japan and Florida and today is in Alabama on display. More about the Pathfinder can be found HERE. Discovery: The Smithsonian always gets the premier aircraft, as they should, so they get Discovery, the oldest survivor in the fleet. And then there’s New York City. More on the OV (“Orbiter Vehicle”) designation number can be found HERE.